YouTube on Notre Dame Fire: Did You Know 9/11 Was Real? As a fire raged inside the historic Notre Dame Cathedral in Paris on Monday, people across the world turned to livestreams to watch flames destroy the 850-year-old structure. But as some YouTube viewers watched live footage of the tragedy, they were also served information about an entirely different tragedy—the September 11 attacks. In May 2018, YouTube began testing a questionable solution to its problem of proliferating conspiracy theory videos—inserting a link to Wikipedia articles about the event that the conspiracy theories relate to. YouTube was criticized for not consulting Wikipedia, before using their material for this program. A month later, Encyclopedia Britannica announced it would allow YouTube to share its fact-checked information. It seems that isn’t working out so well. 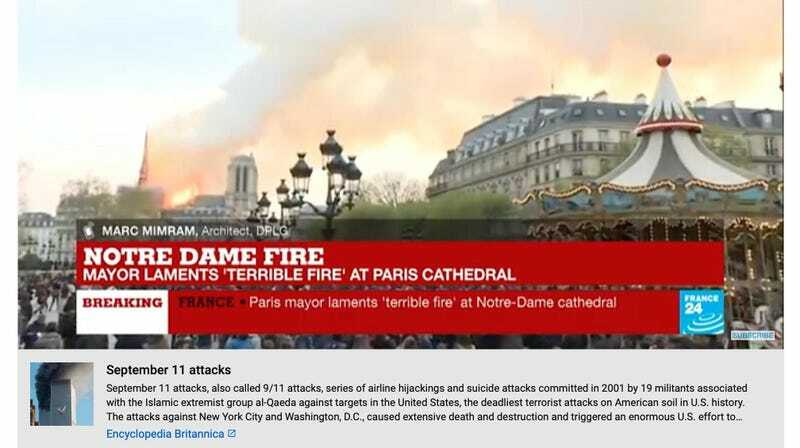 On Monday afternoon, journalists Joshua Benton and Timothy Burke shared instances of YouTube videos showing live footage of the Notre Dame fire including links to Encyclopedia Britannica’s page on the 2001 terrorist attacks, with the image showing a very different building burning. This is just the latest example of why algorithms are, at the moment, ineffective at solving, well, virtually any complex problem. It’s also a reminder that YouTube algorithms know that’s where your mind is going and are very good at preying on that instinct when no one’s looking.